After reading this manual, store it in a convenient location for future reference. manual applies to both models (EL-5230 and EL-5250). the symbols necessary for explanation of each particular calculation. when you sit down. The display is made of glass and is particularly fragile. steam, perspiration, etc. will also cause malfunction. life has expired, or any other cause. pressed first before the key. as a rectangular cursor on the display. ; followed by 5 key. object with a breakable or sharp tip. (See page 115.) and try installing it again. is set correctly, then press j.
when the calculator is not in use. as shown to avoid losing it. • Firmly slide the hard case all the way to the edge. 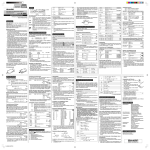 • The quick reference card is located inside the hard case. 4 Cursor keys: Enables you to move the cursor in four directions. • During actual use, not all symbols are displayed at the same time. display and calculation examples of this manual. : Indicates some contents are hidden in the directions shown. Press cursor keys to see the remaining (hidden) section. BUSY : Appears during the execution of a calculation. : Appears when @ is pressed. appear, indicating that inverse hyperbolic functions are enabled. ALPHA: Appears when ;, @ a, x or t is pressed. FIX/SCI/ENG: Indicates the notation used to display a value. : Indicates that a value is stored in the M memory. This calculator has five operating modes to perform various operations. These modes are selected from the MODE key. Press 0 to select the NORMAL mode. number to choose or recall a selection. functions, N-base calculations, Solver function, Simulation calculation. Allows you to perform statistical calculations. Allows you to perform equation solvers, such as quadratic equation. Allows you to perform arithmetic operations with complex numbers. arithmetic operations and also principal features like the solver function. to turn the calculator on. Press @ o to turn the calculator off. in orange above a key, press @ followed by the key. display and type over the original expression. 2. Press e to obtain an answer. using the cursor keys just as you can before the e is pressed. the expression (on ‘8’ in this case). right and is now flashing over ‘3’. 3. Press @ O . • This changes the character entering mode from ‘overwrite’ to ‘insert’. rectangular cursor indicates ‘overwrite’ mode. to the end of expression (@ r). answer for the new expression. Store 23 to variable R.
1. Press j 2 1 then x. • j clears the display. above keys in the keypad). 2. Press R to store the result of 23 in R.
• ALPHA disappears from the display. rather than storing the result of an expression. Find the area of a circle which has radius R.
1. Press j @ s then ;. the above of the display. 2. Press R and then A. Press e to obtain the result. 2 with height 8 and radius 9. • Note that ‘1 3’ represents 1 over (i.e. asks you to input numbers for them. variable further on in the expression. go on the next variable. input a number for the next variable. the calculator recalls that number. • indicates that there is another variable earlier in the expression. Press 8 to input the radius. Input of all variables is now complete. Press e to obtain the solution. displayed on the third line. Press e to confirm the change. press e to solve the equation. • The volume of cone � is now displayed. into the variables at that time. the solver function and the simulation calculations using the same expression as in the last example. previous page in variable V.
the rest of the expression. key), not e, to enter the = sign. was stored in step 9 is displayed. on when you press @ h.
important features are described below. program can be used in either the NORMAL or NBASE program modes. n, x¯, sx, σ x, Σ x, Σ x 2, y¯ , sy, σ y, Σ y, Σ y 2, Σ xy, a, b, c, r.
Will be cleared when changing between sub-modes in the STAT mode. memories, press j x and then choose memory. Press @ P to display the menu. • To initialize the display mode, press 0. The parameters set as follows. statistical data and STAT variables), press 1 y. • To clear statistical data and STAT variables, press 2 y.
erase all data stored in memory and restore the calculator’s default setting. Enter 123456 then correct it to 123459. 2. Press y 9 e.
function as a backspace key. indicates that an entry will be inserted at the cursor. an equation, the y key will function as a backspace key. Previous equations can be recalled in the NORMAL, STAT or CPLX mode. Up to 160 characters of equations can be stored in memory. @ g will display preceding equations. • You can edit the equation after recalling it. change, memory clear (@ P 1 y), RESET, N-base conversion. Input three expressions and then recall them. • Press j to exit the SET UP menu. Scientific notation (SCI) and Engineering notation (ENG). (TAB) can be set to any value between 0 and 9.
between 0 and 9. Entering 0 will set a 10-digit display. notation) system. See the next section for details. memory used when solving equations. the display. To enter this mode, press ;. mode. Press ; to escape from this mode. Store 6 in global variable A. Press j 6 x A.
the second must be a number from 0 to 9. • The VAR menu appears. calculator is ready to enter a name. • This returns you to the previous screen. to the appropriate variable the press e.
5. Press @ v 0 e.
• The value of VAR 0 will be recalled. menu. The cursor appears when r is pressed in the VAR menu. and editing and running a program. 1. Press j 1 k.
• Start entering the expression. 3. Press 0 - 1000 ; A e.
1. Press j 3 A @ s e.
• The area of the base is now calculated. 2. Press j 5 ; < e.
P 1 y), but not if you turn the calculator off. can be added to or subtracted from an existing memory value. • m and @ M cannot be used in the STAT mode. • Calculation results from the functions indicated below are automatically stored in memories replacing any existing values. to 14 digits in accuracy. below to reset the calculator. that you really want to reset the calculator. to use the calculator for the first time. Or, to cancel the operation, press e.
• When corruption of data occurs, the reset procedure may automatically be initiated upon pressing the RESET switch. variables, files and data as described above. are also available for use in other modes. Press b 0 to select the NORMAL mode. • In constant calculations, constants will be displayed as ∆. function menu. The math menu has different contents for each mode. • Switch the display using d u.
N-base functions, Solver functions and Simulation Calculation (ALGB). than or equal to a number. Enter the Solver function mode. Performing a calculation will clear the value in the X memory. You can use both global and local variables in the equation. The answer calculated will be stored in the last answer memory. The differential function is used as follows. Press b 0 to enter the NORMAL mode. Input a formula with an x variable. Input the x value and press e.
Input the minute interval (dx). • To exit the differential function, press j. * X memory is specified by pressing ; then the 3 key. The Integral function is used as follows. Input the starting value (a) of a range of integral and press e.
Input the finishing value (b) of a range of integral and press e.
• To exit the integral function, press j.
positive and negative integral values exist depending on the interval. latter case, separate the positive and negative values. and will also shorten the calculation time. random numbers in succession, press e. Press j to exit. numbers in succession, press e. Press j to exit. succession, press e. Press j to exit. e. Press j to exit. • The result may not be the same each time this operation is performed. The previous calculation result can be used in a subsequent calculation. However, it cannot be recalled after entering multiple instructions. fractions, and conversions between decimal numbers and fractions. converted to and displayed as a decimal number. AND, OR, NOT, NEG, XOR and XNOR on binary, pental, octal and hexadecimal numbers. @ z: Converts to the binary system. ‘?’ appears. @ r: Converts to the pental system. ‘q’ appears. @ g: Converts to the octal system. ‘f’ appears. @ h: Converts to the hexadecimal system. ‘6’ appears. pressing ,, m, A, 1, l, and i key respectively. Conversions can be performed between rectangular and polar coordinates. • The calculation result is automatically stored in memories. • r and x values are stored in the last answer memory. physical constant designated by a 2-digit number. designated number of decimal places. of Standards and Technology), or on ISO specifications. STAT mode and PROG mode using the following 12 types of prefixes. This function enables you to find any variable in an equation. The solver function is used as follows. Enter both sides of an equation, using ‘=’ and variable names. Enter the value of the known variables. Move the cursor (display) to the unknown variables. • To exit the solver function, press j. NORMAL mode by pressing j. Try finding the variables in the equation below. = ; C k ; D.
• You must enter the whole equation. • Enters a value for known variable A. • Enters a value for known variable B. • Enters a value for known variable C.
have to be set to 0 to solve the equation. • The answer is displayed on the top line and the values of the lefthand and right-hand sides of the equation appear below. 9. Press d 8 e.
• Substitutes the value 8 for B. • To cancel calculation, press j when ‘calculating!’ is displayed. sets of values in the same expression. The simulation calculation is used as follows. Enter an expression with at least one variable. after entering the value for all used variables. • You need enter only the side of the equation that contains the variables. be overwritten with new values. • The answer calculated will be stored in last answer memory. • To exit simulation calculation, press j. 2. Press @ J 0 0 j. • Sets the angular unit to DEG. out the variables in alphabetical order. calculator displays that value automatically. • indicates that there are more variables. indicates that this is the last variable. 8. Press e and then 45 e.
not have to re-enter these values. deleted in the NORMAL mode. Press f in the NORMAL mode to call the EQUATION FILE menu. You can save an equation as follows. alphabetic characters easily. To cancel the ALPHA setting, press ;. want to save the equation, press j. Press e to save the equation. • The display returns to the display before pressing f.
used in the equation are saved at the same time. Retrieve or delete an equation as follows. equation was retrieved are cleared. The STAT mode is used to perform statistical calculations. then select the required sub-mode. • Use I key to perform a STAT variable calculation. entering new data, clear the memory contents. stored as a set of three data items. Delete incorrect data with j, then enter the correct data. Use u d to display the data set previously entered. number of the data set). u d, input the correct value, then press _ or e.
data set will be deleted. entered data and input the values, then press _.
to or greater than 1 × 10100. • Values for P(t), Q(t), and R(t) are given to six decimal places. x = 60 → P(t) ? t = –0.5 →R(t) ? unknowns (3-VLE) may be solved using this function. • If the determinant D = 0, an error occurs. to or greater than 1 × 10100, an error occurs. • The results obtained by this function may include a margin of error. Press b 3 0 to select 2VLE of the EQN mode. • Coefficients can be entered using ordinary arithmetic operations. • To clear the entered coefficients, press j.
u to jump to the last or top line. press e to solve the 2-VLE. return to the coefficient entering display. You can use @ h to solve the 2VLE, regardless of the cursor position. Press b 3 1 to select 3VLE of the EQN mode. 3. After inputting the last coefficient, press e to solve the 3-VLE. • Press d to display the det(D). VLE, regardless of the cursor position. • If there are more than 2 results, the next solution can be displayed. 3x2 + 4x – 95 = 0 → x = ? QUAD of the EQN mode. • Press d or u to move line by line. quadratic equation, regardless of the cursor position. 5x3 + 4x2 +3x + 7 = 0 → x = ? CUBIC of the EQN mode. division of complex numbers. Press b 4 to select the CPLX mode. stored in the M memory will be cleared. zero, is treated as a real number. mode or in the NBASE program mode. NORMAL program mode or the NBASE program mode. perform logical operations and calculations using N-base numbers. NOT type commands manually using the ; key. programming. The Filing Equation function does not work in PROG mode. • While entering a program name, keys are locked in ALPHA mode (ALOCK) automatically. the left. Lines do not wrap in the PROG mode. • A program name can have up to 7 letters. time before entering an alphabetic character. • You are now ready to write a program. press u, d or e.
also use the additional programming commands in the i menu. Global and local variables are treated differently in the PROG mode. • The letters A – Z and θ, used on their own, represent global variables. programs and use them in any mode. variables retain values only in an individual program. be set to the value last stored in that memory. proficient at typing programs into your calculator. base of 4 units and a height of 3 units. Select the NORMAL program mode. the alphabet-lock mode. Press ; to escape from this mode. the program automatically prompts you to input a value. • For more programming examples, see Chapter 8: Application Examples. described, excluding keyboard commands and I menu commands. • Press d or u to scroll page by page. last three lines will be displayed. until you press any of the keys. while the program is waiting. be used for the label name. line that indicates where to go. nested up to ten levels deep. Defines the end of a subroutine. You can also enter ‘=’ by simply pressing ; =. selected, the statistical command menu cannot be called. data previously stored in the STAT function. Select the program you wish to edit and press e.
• If you want to add text into your program, press @ O.
beginning of the line and press e to add a new line there. commands on a single line. • Any blank lines will be ignored when running. Press j to exit the EDIT mode. The calculator displays an error message if a program encounters a problem. can display the line where the problem has occurred. see the message on the right. to delete and press e.
you want to delete the program. window for creating a NEW program. Enter the program as follows. • See ‘*’ below for further explanation. conversion you wish to perform. 2 for “F TO C”. conversion you wish to perform. Then it asks you to enter the temperature value. Formula which is true for any plane triangle. 4. Press j to return to the PROG mode menu. Enter 20 for A, 35 for B and 40 for C.
number to binary, pental, octal and hexadecimal formats. Type NBASE for the title then press e.
• A NEW program called ‘NBASE’ will be created. Press j to return to the PROG mode menu. Press 0, select the program ‘NBASE’ and press e.
• Be careful when using the Wait command in NBASE program mode. number base, binary, pental, octal, decimal or hexadecimal. reliability of a mean value can be evaluated. A’s SHOP sells cookies by package on which it is stated contents are 100 g.
Buy 6 sample packages and check if the statement is true. Press b 2 1 0 to open a window for creating a NEW program. Type TTEST for the title then press e.
• A NEW program called ‘TTEST’ will be created. Press 0, select the program ‘TTEST’ and press e.
Enter the expected mean value ‘100’ and press e.
variables G, H, I, J, K and M are used. Type CIRCLE for the title then press e.
• A NEW program called ‘CIRCLE’ will be created. through points P(1, 9), Q (7, 1) and S (0, 2). Press 0, select the program ‘CIRCLE’ and press e.
Enter the coordinates (X 1 to X3, Y1 to Y3) for the three points. The center is (4, 5) and radius is 5.
residual amount of 14C it contains. how old the specimen is. It then finds the half-life of 14C. Enter 100 for M0 and 50 for M1 . The half-life of 14C is 5719.980034 years. Type DELTAY for the title then press e.
• A NEW program called ‘DELTAY’ will be created. 140 respectively, obtain the impedances R1, R2, R3 of a Y circuit. Press 1 e to select ‘DELTA TO Y’ transformation. Enter 70 for Z 1, 35 for Z2 and 140 for Z3 . weight of the bar is W, obtain the tensions in the strings S and T.
Type TENSION for the title then press e.
• A NEW program called ‘TENSION’ will be created. 40 kg, angle A: 30° 15' 20" and angle B: 27° 45' 40". decimal point of 3 .
be automatically converted to decimal degrees. Enter 30 [ 15 [ 20 for angle A and press e.
Enter 27 [ 45 [ 40 for angle B and press e.
Enter 40 for weight W and press e for S.
program determines the payment per month. Type PAYBYMN for the title then press e.
• A NEW program called ‘PAYBYMN’ will be created. rate of 1%, how much is the monthly payment? Enter 3000 for P, 500 for D, 11 for N and 1 for I. Your monthly payment is approx. $241. enough space to roll dice. and display the result and wait until any key is pressed. Type DICE for the title then press e.
• A NEW program called ‘DICE’ will be created. Press 0, select the program ‘DICE’ and press e.
Enter the number of dice to play and press e.
Press e (or any other key) to continue to play. Press j to quit. How many digits can you remember? to enter the number you remembered. After 10 tries the score is displayed. Type NUMBER for the title then press e.
• A NEW program called ‘NUMBER’ will be created. Press 0, select the program ‘NUMBER’ and press e.
Enter the number of digits you wish to play with N.
Enter the number of seconds to display the numbers. Immediately after you press e, the game will start. and press e. After 10 tries, the score is displayed. first, convert this time into seconds. • Determining the value of T.
Press @ J 1 1 4.
; G ; M ) k ; R 1.
the luminosity of the star. a distance of 10 parsecs (about 32.6 light years). is given by the equation. Press b 0 and @ P 0. 4.8 - 2.89 ) ) e.
The star is nearly six times as luminous as the sun. Press 4.8 - ( l 0.0003 z 0.4 ) e.
you can perform this type of operation using single-variable statistics. and in the quantities shown. What was the total sales figure? Press b 1 0 to select the single-variable statistics mode. • All the data is entered. Press I 0 4 e.
■ Total sales were $13254.15. correct order. Which lottery gives you the better chance of winning? Press b 0 50 @ N 6 e.
Press 35 @ e 5 e.
■ Your chances are better in the first lottery. • Use only the specified batteries. Improper handling of batteries can cause electrolyte leakage or explosion. Do not mix new and old batteries. Make sure the new batteries are the correct type. When installing, orient each battery correctly as indicated in the calculator. before reaching the service life stated in the specifications. • The calculator does not turn on when j is pressed. • The message ‘Change Batteries’ appears. result in the memory contents being cleared. may result in the memory contents being cleared. clothes, immediately wash with clean water. from leaking batteries, remove them and store in a safe place. • Keep batteries out of the reach of the children. • Do not press j until the battery replacement procedure is complete. Turn the power off by pressing @ o. Lift the battery cover to remove. • Replace one battery at this step. Install a new battery with the positive side (+) facing up. Repeat steps 4 and 5 to replace the other battery. ball-point pen or similar object. repeatedly to darken the display. following amount of memory is available. functions) in the NORMAL mode. For a detailed description of how memory is used, refer to ‘Memory usage’. delete data. Press e to cancel the operation. • Once a file has been deleted there is no way to recover it. calculator. Refer to page 32.
the function you are trying to apply. zero or made some other calculation error. * 5 buffers in the CPLX mode. left-hand sides of the equation. are selected according to the range of expected values for the equation. in turn (starting with the lower limit of the range of expected values, a). the same (to 10-digit accuracy) twice in succession. be used in the calculation. +1 × 1010) when the current equation is cleared or the mode is changed. values, press j to return to the previous display. b) or initial value close to the expected solution. appears as a denominator (e.g. y = 8/x + 1). Solving y =10x – 5 for y = 0.
and will not obtain an accurate solution. Solving y = sin x for y = 0.
x = 3, no solution is obtained. the correct solution of –1. functions, and in programmed repetitive calculations. ±10-99 to ±9.999999999 × 1099 and 0.
example, the two lines of the program shown below use 60 bytes. editing a program and deleting a program. Ez a készülék megfelel a 89/336/EGK sz. EK-irányelvben és annak 93/68/EGK sz. Tento pﬁístroj vyhovuje poÏadavkÛm smûrnice 89/336/EEC v platném znûní 93/68/EEC.